Mini foods are not only cute (seriously, people always oooh and aaah over them! ), but they’re also great for parties. You know what I mean–you’re standing talking to someone, juggling a plate, silverware, and of course a cocktail. It never works, and something always ends up spilling or you stuff your face when the conversation is over. Behold the mini lasagnas! Perfect for parties (or really, anytime), these are baked in a mini muffin tin, so they’re really tiny and can be eaten in two to three bites. No fork and knife required! 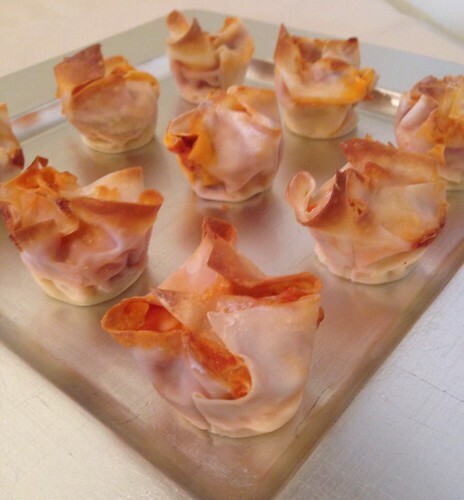 And they’re simple to make too–no boiling pasta noodles, just use wonton wrappers in their place. Easy peasy, and a huge hit! In a large bowl, add the ricotta, 1 cup of shredded cheese, and salt and pepper. Stir to combine. 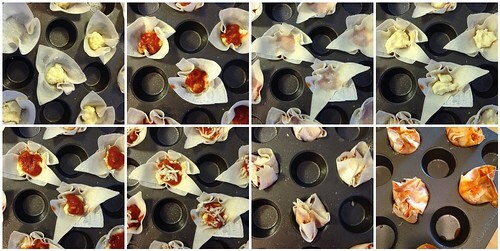 Coat mini muffin pans with cooking spray, and place a wonton wrapper in each cup. * Top with 1 tsp of the ricotta mixture, followed by 1/2 tsp of the meat sauce. Place a cut wonton wrapper over the sauce, and repeat the layers by adding ricotta cheese, meat sauce, and a sprinkle of shredded cheese. Fold in corners of wonton wrappers. Bake at 350 degrees for 13 to 15 minutes until the cheese is melted and the wonton wrappers are golden. Allow to cool in the muffin tin for 5-10 minutes before serving. Makes 32 mini lasagna cups. *I did every other cup so it’s easier to see the process in the photos, but you don’t have to leave space. Recipe adapted from a bunch of recipes. Thanks Google! And that’s the part I hate. With baking, you know that if you mix a specific amount of sugar and butter, you will end up with a fluffy creamed mixture just calling for flour and other dry ingredients. So not true with cooking. So when I watched The Best Thing I Ever Made and practically salivated over Andrew Zimmern’s chicken wings, I decided to give them a whirl. And the recipe worked. 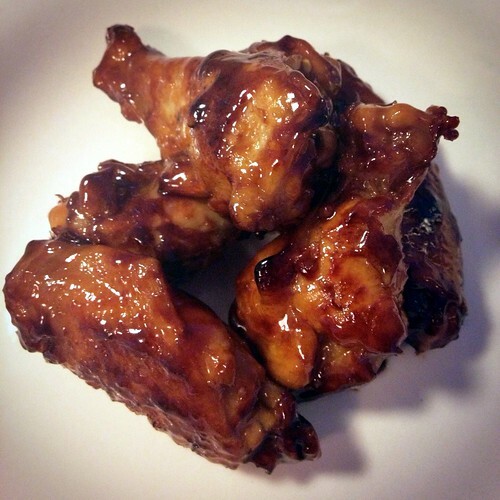 The wings were sticky, spicy, and full of flavor. (And I even tasted the sauce and added more heat.) I can see them being a hit at Superbowl party, Oscar party, or even just on a Wednesday night. So if you’re a bad cook who likes to eat well, try this recipe. You won’t be disappointed! Place a 14-inch nonstick saute pan over high heat. Add the chicken and dry-sear to lightly brown the chicken. Add the sake, soy sauce, 1/3 cup water, brown sugar, mirin, oyster sauce, ginger, and dried chile and bring to a simmer. Cook, covered, about 12 minutes. Uncover and simmer until the pan is almost dry, tossing frequently to coat the wings, 10 to 12 minutes. Skim off the fat if you like, and serve, garnishing with scallion shavings and sesame seeds. Recipe adapted from Andrew Zimmern. Don’t worry, you’re on the right blog. This is Nosh With Me. But now we’re cooking! This may come as a surprise to many of you, but I don’t eat cookies, cakes, and candy for every meal. I do try to cook every now and then, but I have to admit, I am horrible at it. I think what makes me a good baker is what also makes me a terrible cook. In baking there are always exact measurements and specific ingredients, and in order to make a substitution you need to know about the ingredients. In cooking, if it tastes good, it works. What I do cook is always very simple and usually something that either can be grilled or steamed, or comes from the freezer section of Trader Joe’s. I do have a few actual recipes that have proven successful, but they tend to have lots of cheese and aren’t very healthy. Now that I’m back to counting points, I’m constantly searching for easy low-fat yet still yummy recipes. Fortunately for me, shrimp is both delicious and a good protein, and the last time I was at the market, I bought a two-pound bag (hello, I live alone) of fresh frozen shrimp (it was on sale and the fish guy said it was an amazing deal–I’m a sucker) and I immediately got to work searching for recipe that seemed foolproof. Fortunately, I stumbled upon this one. The original recipe includes peppers and asparagus, but I’m more of a broccoli fan, so I swapped that out. It also says to cook the vegetables in oil and add lemon zest and salt, but I steamed my broccoli and left out the salt and zest (I’m living on the edge here). I didn’t make any additional changes, but I did omit the parsley, just because I can’t stand the stuff (why yes, I am a picky eater). 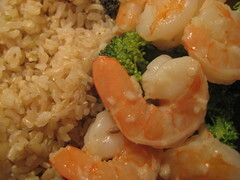 I am quite pleased with the results–the sauce is garlic-y and lemony and it was great spooned over the broccoli and shrimp. And the way I prepared it made it only three points so I enjoyed it with some brown rice (from Trader Joe’s, naturally), yum! Steam vegetables and cover to keep warm. Heat oil in a large nonstick skillet over medium-high heat. Add garlic and cook, stirring, until fragrant, about 30 seconds. Add shrimp and cook, stirring, for 1 minute. Whisk broth and cornstarch in a small bowl until smooth and add to the pan along with salt. Cook, stirring, until the sauce has thickened slightly and the shrimp are pink and just cooked through, about 2 minutes more. Remove from the heat. Stir in lemon juice and parsley. Serve the shrimp and sauce over the vegetables.